Many students use and are issued laptop computers enable to have access to their class work and research materials on and off campus. However when they are used for prolonged periods in the classroom, it is suggested that an auxiliary keyboard be used to create a comfortable and safe computing environment. These, sometimes wireless, keyboards are inexpensive and allow the laptop monitor to be placed atop a standard computer table while the keyboard can rest on a keyboard tray placed at the proper, lower height. Visit the computer table and lab table grouping from Worthington Direct that includes accessories such as retractable keyboard trays, mouse trays, CPU tower racks and wire management systems. With many schools switching to laptop use over traditional desktop computers, there is more space opening up in the classroom. While standard table depth is generally 30″D, a smaller 24″D table can be used with a laptop. Wire management is also less of a concern and most laptops work on a wireless network. With this additional space in the classroom room or technology lab, teachers have more room for other AV equipment such as projector carts, projector screens, reversible dry erase boards, and mobile computer chairs. 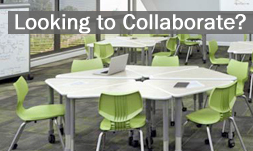 Classrooms that share laptops will find great use in a laptop storage and charging cart by either Bretford or Balt. These carts are available in several models that can store and transport from 10 to 30 laptops. Simply position the cart near an electrical outlet and charge all of the laptops at once and have them ready to go before the next lesson. Locking doors keep laptops safe and yet ventilate heat when charging.